Last Friday was Veterans Day, an important holiday when we honor those who have served in our military, particularly in foreign wars. With that in mind we felt it important to discuss substance abuse disorders and assisting people, who are or who have served in the armed forces, in receiving the help they need. The military is very different sector of employment than others, people working a career in the military are held to different standards than, let say, people working for Home Depot. If someone who is not in the military is struggling with drugs or alcohol, and they seek help, there is a small likelihood that it will affect their standing at work and their ability for upward movement in the company. However, the same cannot be said for those serving in the military who meet the criteria for addiction and need help. In fact, people with alcohol use problems are far less likely to seek help for fear of it affecting their career, according to researchers who sought to find the best method of intervention for service men and women, ScienceDaily reports. The findings were published in the Journal of Consulting and Clinical Psychology. Despite the fact that 47 percent of active-duty military members were binge-drinkers in 2008, the fear of seeking treatment for an alcohol use disorder is quite common, according to the article. 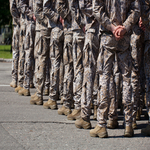 The researchers point out that only a small number of military members are referred for evaluation or treatment, and those who do seek help could be subject to disciplinary action or other repercussions. "If you're in the military and you seek substance abuse treatment, your commanding officer is notified and it goes on your medical record and your military record. That's a huge barrier," said Denise Walker, director of the Innovative Programs Research Group at the University of Washington School of Social Work. Reduced their drinking over time. Had lower rates of alcohol dependence. Were more likely to seek treatment. "The intervention really connects their behavior with their values and goals and wants for themselves," Walker said. "It's a safe place to talk confidentially and freely with someone on the other end who is compassionate and non-judgmental."